Following their defeat and expulsion of the Saracens (Arab Muslims) out of Portugal , the Portuguese, under Prince Henry, sought to ensure a total freedom from Saracen threat and invasion by pursuing them into North Africa ( Morocco ). There they established their presence and a stronghold at Ceuta. As a sign thereof, the Portuguese converted the mosque of Ceuta into a Catholic Church; and with the introduction of a statue of the Blessed Mother, Mary , they dedicated the church and the continent on which it stood to Sancta Maria of Africa . This was the beginning of Catholic missionary presence and activity on the North-West coast of African; and by the end of 1460, the year of the death of Prince Henri, Portuguese explorers had reached as far as Sierra Leone. Under King Affonso V, the Portuguese explored the West African Coast further south; and in 1471, the need for fresh water introduced them to the coast of Ghana, at Shama, where the river Pra entered the sea. They berthed in need of water, but they departed having discovered a “Gold Coast” . From 1471 to 1481, heavy trade was carried on with villages around Shama including Elmina (Edina); but all of this was from ships anchored off shore. In 1482, the need for a permanent trading post on land made the Portuguese, under Prince Joao (later King Joao II), decide to build a fortress on the coast of Edina, which the Portuguese called EL MINA (the mine). And so, in January 1482, Diego D'Azambuja landed at Elmina to lay the foundation of a castle. His party, with arms concealed under their coasts, chose a spot on a rocky promontory on the coast, hoisted the Royal Standard of Portugal upon a high tree, erected on altar beneath the tree and celebrated a solemn mass. They prayed for the success of their trade, the conversion of Africans and the endurance of the church, which they were about to found (cfr, Allister McMillan, The Red Book of West African, London 1968, 142). The castle would later occupy the site. The church would operate from the castle; and this castle church would be the first Catholic Church in Ghana. Indeed, Pope Sixtus IV, on August 21 1471, ordered the Archbishop of Lisbon to see to it that all along Africa's coast, churches were built. The same Pope also grated the Knights of Christ spiritual jurisdiction over all churches in West Africa. These would build a monastery in Sao Thomé and until the day, when bishops would be stationed along the coast of Africa, the Portuguese mission churches were to remain under the jurisdiction of the Vicar of Sao Thomé. At Elmina, however, the chaplain of the Portuguese traders and forces would be the first missionary to the local population. It was not until 1503 that the first conversion and baptism would occur. The paramount chief of the Efutu , Nana Sasaxy and six of his noblemen met with an official of the captain of the castle, Diogo de Alvarenga, and the vicar, and received baptism. The following day, Nana Sasaxy erected a small shelter on a hill across from the castle. There, the vicar, Alvarenga and members of the Portuguese garrison met with Nana Sasaxy and his party and celebrated the mass. This shelter was the first Catholic Church outsider the castle; and it was named church of St. Jago . In all of this, as Alvarenga wrote to the king, the Portuguese sought to promote “ God's glory and his highness' interests” . In 1534, Pope Paul III created the new Diocese of Sao Thomé, from the Ivory Coast to the Cape of Good Hope, and the church of St. Jago of Elmina fell under this new jurisdiction. The first Bishop of the new Diocese was Diogo Ortiz de Vilhegas. In response to the increasing presence on the coast of secular priests and chaplains, who were more interested in gold-trade than missionary work, Bishop de Vilhegas, in 1572, brought in four Augustinian priests, who engaged in catechesis and training in reading and writing. The church spread in the villages around Elmina and in Efutu. Pope Gregory XV founded the Congregation for the Propagation of the Faith, to which he referred all matters about missions. In a well-considered response, the Office for the Propagation of Faith granted only personal faculties for the blessing of vestments, corporals and palls to the Vicar of El-Mina alone in 1632. El-Mina or, simply, Mina , in Portuguese correspondence with the Propaganda Fide in those days referred to the Portuguese castle-city of Sao Jorge and the village of Edina . 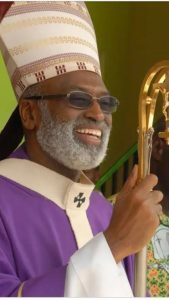 Its pastoral care was in the hands of a Vicar, subject to the Bishop of Sao Thomé, and four chaplains; and beside El-Mina, there were churches also in Komenda and Efutu. “He told how Diego de Azambuja had received from Caramansa (Kobena Ansah) the land on which the castle was built and how all the attempts to convert this chief had been in vain. He told how churches had been built in Efutu and Komenda and the religious in charge beaten to death, and all the church furnishings stolen. The contemporary Christians in Mina , he went on to say, were Christians only in name, going to confession only under pressure, and then not even knowing how to make a good confession, or what to confess. The greatest good being accomplished in Mina was the baptism of infants who died before attaining the age of reason. As for the African women who lived with the Portuguese traders in the fort, they were the only ones considered well enough instructed and properly disposed to receive Holy Communion. As for paganism, the village was rife with superstition and magical rites of which the people were so fond that they allowed only every other child to be baptized … and those baptized were quickly corrupted by their pagan brothers and sisters….” (R. Wiltgen, Gold Coast Mission History 1471-1880, Techny 1956, 29).